Kyrgyzstan is a nation that has suffered through ethnic conflict and instability. Hunger is on the rise too with 25 percent of the population food-insecure. The price of food, particularly wheat flour, has dramatically increased placing further strain on these families. The UN World Food Programme (WFP) is helping provide food aid which is especially crucial in the winter months. Elizabeth Zalkind of WFP says three-month rations are provided to 231,000 people in impoverished areas which become nearly impossible to reach during harsh winter. The people need this food literally to survive. With so much hunger and poverty in these communities, as well as the ethnic tensions, people look for hope. Food for Work projects sponsored by WFP offer a way to tackle these societal problems. These are initiatives where workers are provided food rations while they complete projects aimed at building communities. One Food for Work (aka Food for Assets) project helped restore an easier passage to the village of Kosh-Bulak, which becomes hard to reach during winter. This was done using concrete rings to reinforce the passage, with help provided by the United Nations Development Project. Connecting communities is key to building their economy. WFP has also sponsored projects feeding 115,000 people in Kyrgyzstan including re-forestation, rehabilitation of irrigational networks, riverbank reinforcement, restoration of mud flow canals. Food for Work offers a way to reduce hunger while working on these projects, which in time can reduce or eliminate the amount of aid needed. In Kyrgyzstan the projects have an extra benefit of bringing together people from different ethnic groups. This helps build peace while reducing the poverty that threatens everyone. Much work needs be done to reduce hunger in Kyrgyzstan and with WFP relying on voluntary funding that becomes a major issue. WFP believes food security could worsen come spring when the winter rations they provided run out. 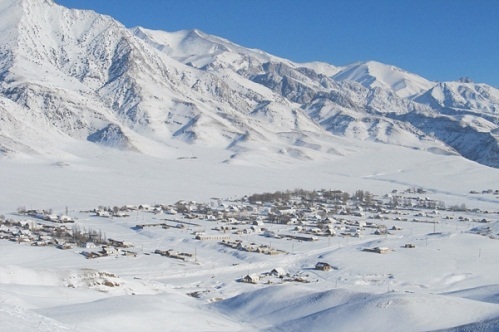 Article first published as Food for Work, Winter Rations Crucial in Kyrgyzstan on Blogcritics.